Description: London, Frederick Warne & Co. Aunt Louisa's London Toy Book series 1869 inscription Colour plates (6) printed by Kronheim. . 265x228mm blue pictorial card wraps (covers rather stained and split at spine but cromplete with some creases & rubbing) 6 pages of text + 6 chromolith pages. Leaves loose though once sewn with very thin thread, now broken, so though paper tanned/foxed with slight edge chips there are no tears. All printed one side only and quite complete. Presentation inscription "Presented to (first name illegible) Sears by Mrs. Danl. B. Lincoln Dec.25 1869". 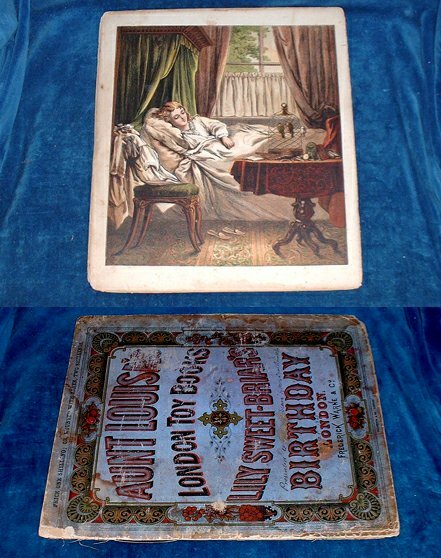 *One of the early Aunt Louisa series with rather pious moral verses but charming Victorian scenes of family gatherings.